Ok, this guy is the absolute definition of a hero. The wildfires in California have been the worst nightmare in anyone’s collective memory, hundreds of homes have burned, whole communities have vanished, and whole towns have nearly been wiped from the map as the blaze continues to wrack up it’s death toll. 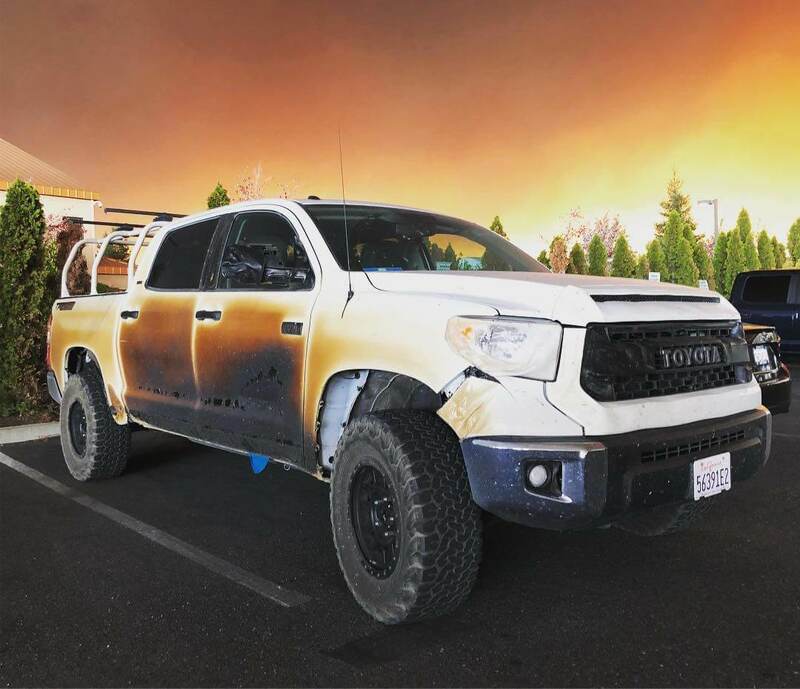 One exceptionally brave nurse Allyn Pierce in a (formerly) pristine Toyota Tundra braved the inferno, driving through flames back to his post in Paradise, California where he and countless other nurses, doctors, and medical professionals helped those who were left behind. Allyn is ok, and the Tundra still runs, as well it should, if anyone remembers the old Top Gear, it takes more than a bit of fire to keep a Toyota down. Sure, the Tundra is the red headed step child of the Hilux, but it’s got a lot of the same DNA lurking under those plastic panels, but has definitely suffered some pretty major scorching. I mean, I already said it but this guy is an absolute hero. You can check out the whole story below as reported by the New York Time’s Jack Nicas on twitter, how many of us can say that we’d do the same in the same situation? I think I’d probably just curl up in a ball and die. Only one thing remains unreported, is he going to have to pay the tax on the gift of the new Tundra, or is Toyota covering that too? It’s likely a one time PR stunt (great though it may be.) but it may be setting a dangerous precedent, if I got my pickup torn apart by bears rescuing school children from a tsunami, do I get a free truck too? There’s going to be idiots like me coming out of the wood work.